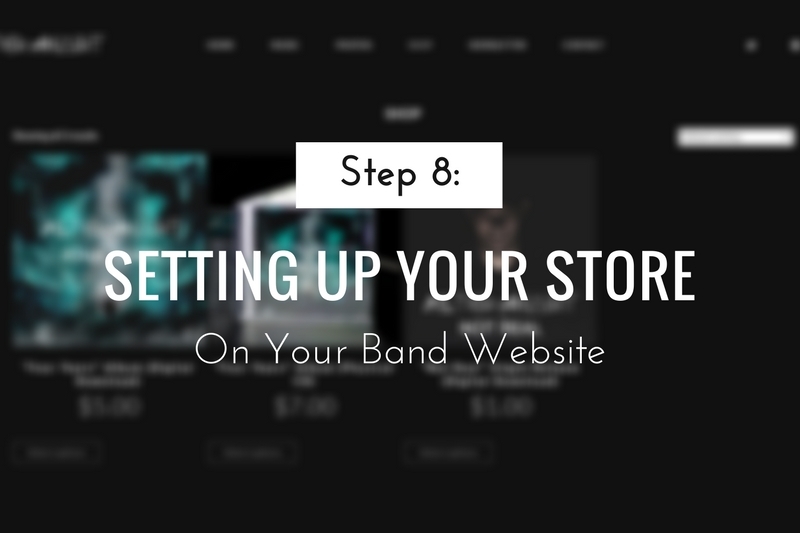 In this post, I’ll show you how to set up a shop page on your website. To do this, we’ll use a free plugin called WooCommerce. 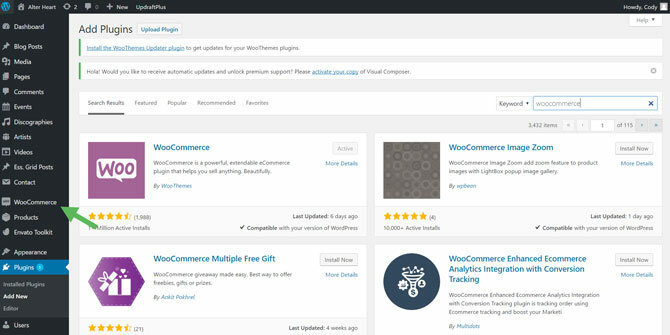 This is the most popular and expansive e-commerce plugin for WordPress. First, I’ll show you how to install the plugin. Then, I’ll run through the settings and show you how to add a product (like a CD, t-shirt, or digital download). These are the general settings for WooCommerce. Here you can set your location, decide whether you’d like to ship to certain countries, enable taxes, and set your currency. This are has a fection different sections. Under “General”, you can set the units you want to use for weight and dimensions. 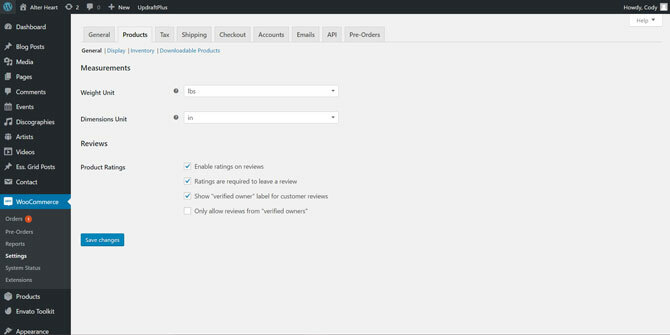 Under that you can decide if you want to enable reviews for your products. First, you can decide what page you’d like to use for you Shop page. 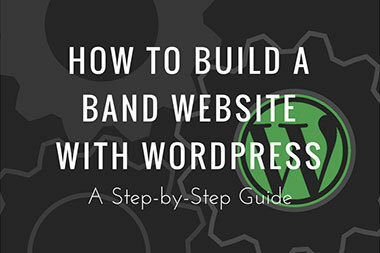 If you haven’t created one yet, WooCommerce may prompt you to create one. However, it likely created one for you when the plugin was installed. 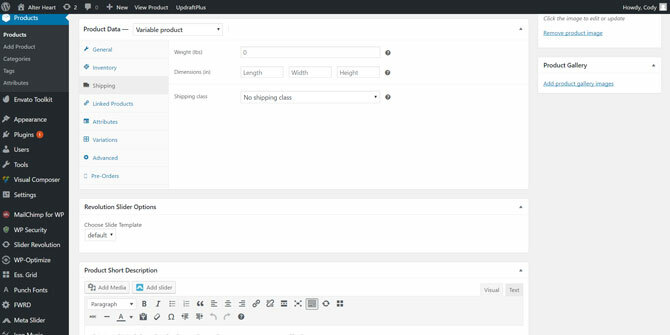 Scrolling down further, you can set the size of the product images. I would leave this how it is for now. 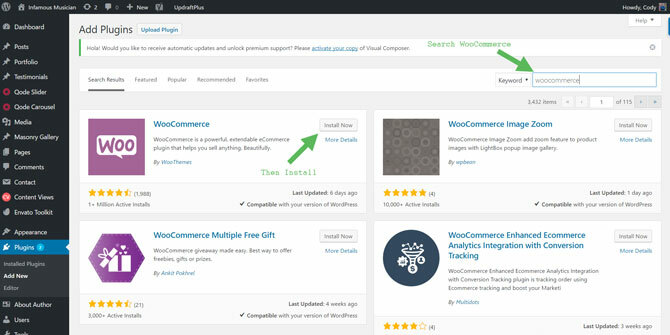 Here you can decide if you’d like WooCommerce to keep track of your inventory. 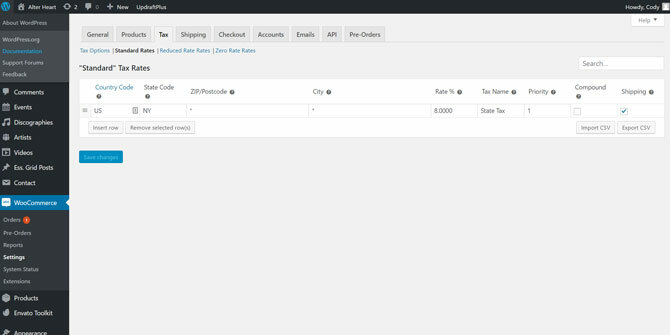 So if you have 60 t-shirts, and you sell 10 through the site, WooCommerce will keep track of that. It will also let you know when you’re low or run out. 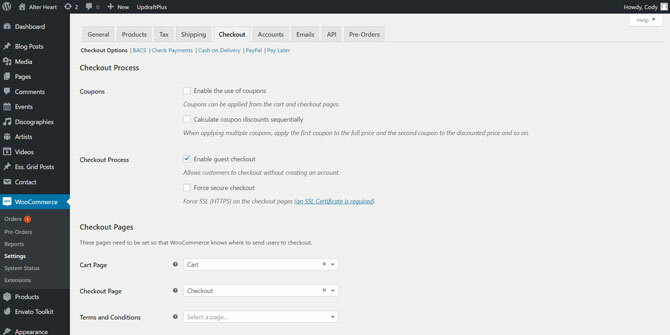 You can set what WooCommerce should define as “low” under “Low Stock Threshold”. 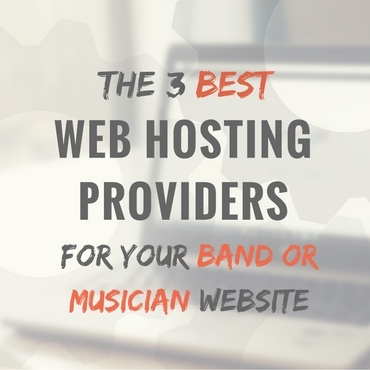 Here you can decide how downloadable products are handled. I would leave it set to “Force Downloads”. Here you can decide to include tax in the price, where to calculate the tax, set up shipping classes and more. Honestly, I wouldn’t mess around with this section too much unless you need to set up specific tax rates. Here you can create a tax rate to be applied to all your products. When I built www.alterheart.com (the site these screenshots are taken from), I was living in New York. So I set up a tax rate for New York. Then, since I decided to tax people based on their shipping address (in the previous area “Tax Options”), anyone who placed an order that shipped somewhere in New York would be charged 8%. Everyone else was not taxed. Here you can create shipping zones. So for instance, you can create a zone for each country you ship to. If you’re in the U.S., it will already be set up. Note, when creating a product you’ll need to include the product weight and dimensions for this to work. The easiest and likely best payment option is to choose Paypal. This is simple to setup. First, click “Paypal”. Then under the Paypal section, add your Paypal email. Then save your settings and you’re set to receive payments on your website through Paypal. 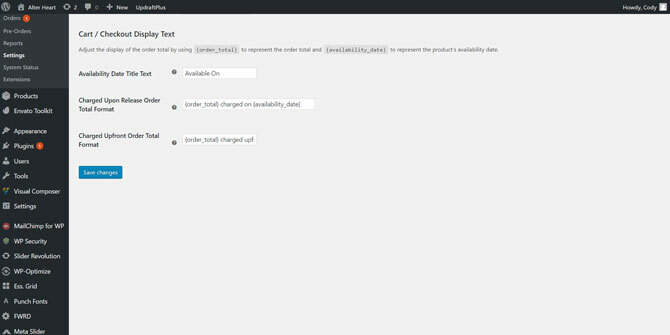 Here you can enable where you’d like visitors to register for your site when they make a purchase (if you elected to not use guest checkout). I would leave this page as-is. 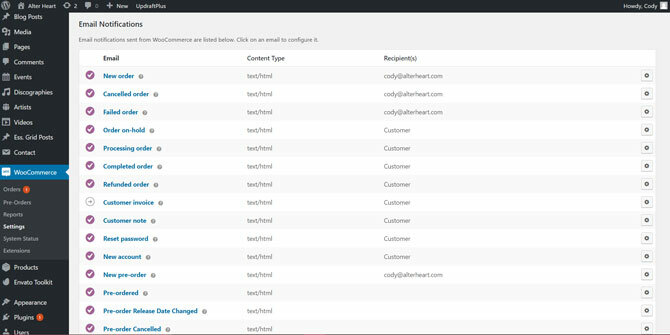 Here you can set where you’d like each email to be sent. Leave customer emails set how they are. But for the others, you can add a different email if you’d like WooCommerce to send order emails to that address. If unsure, leave this as-is. The final tab I want to cover is the “Pre-Orders” tab. This tab will not come with WooCommerce stock. You will need to purchase a different plugin to setup pre-orders on your site. The plugin you’ll need is WooThemes’ Pre-Orders Extension. 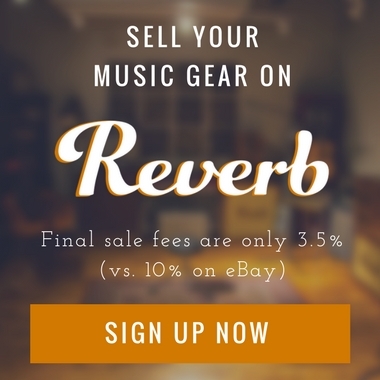 The plugin is a bit more on the pricier side at $129. But, I’ll show you options below in case you want to get that plugin. If not, just move along to the next section. Here you can change the text of the pre-order button and messages. If all of this looks a bit too complicated to you, you can just leave the settings as is. They’ll be fine set how they are should you want to offer pre-orders on your site. First, you can name your product in the box at the top of the page. 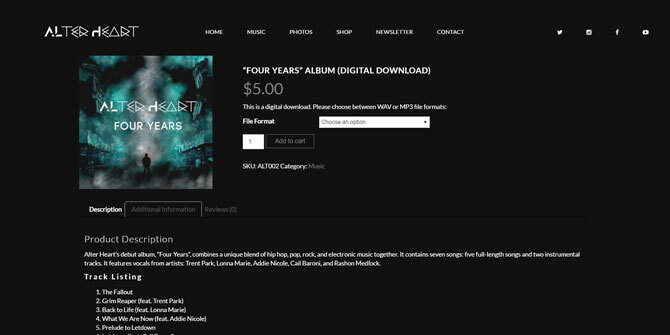 In the above example, my product’s name is “Four Years” Album (Digital Download). I chose to include digital download within the title so visitors immediately know this is a download and not a physical product. Moving on is a text box where you can add the product’s description. I’ve chosen to include the track listing and again reiterate that it is a digital download. 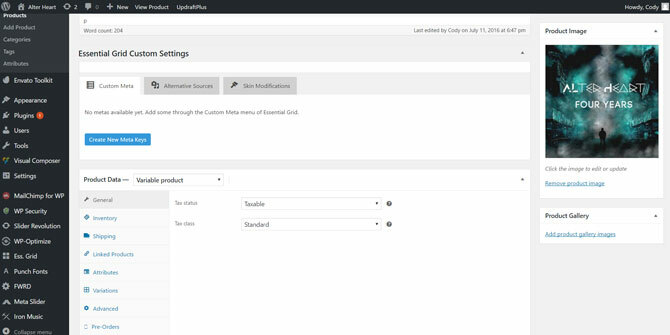 Now, I’m not entirely sure but I believe the “Essential Grid Custom Settings” area enables you to add and customize a photo grid (gallery) on this page. However, this is not necessary to set up (and if you don’t have the Essential Grid plugin installed, you won’t see this option). In the box to the right, labeled “Product Image”, you can add the featured (or main) image for this product. This is the image that will show up on your shop page with the rest of your product listings. Then, you’ll see a box labeled “Product Data” (at the center of the page). The first tab is labeled “General”. Here you can decide if this product is taxable and which tax class (rate) to use. Here you can a product SKU (a unique product identifier). This is not necessary to do but on my product, I’ve chosen to add one “ALT002”. 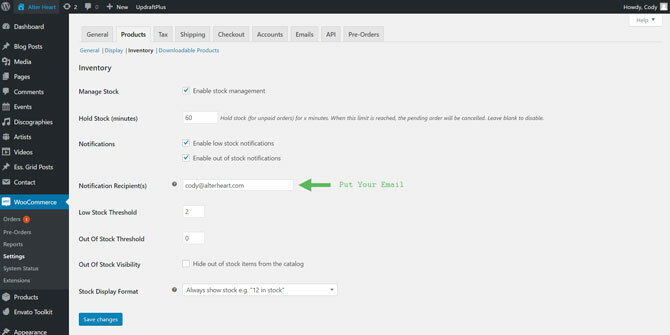 You can also enable stock management here. Here you can add the weight, dimensions, and shipping class for the product. Since this product is a digital download, these don’t need to be filled in. Here you can select related products you’d like to show with this product. This will show up at the bottom of the product page. Here you can set the different attributes for this product. Attributes are used to create product variation. 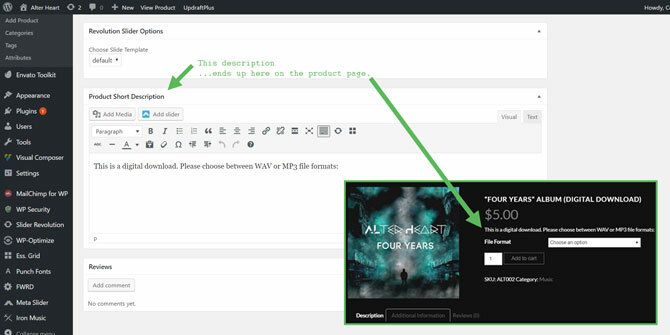 In my example, I’ve chosen to create an attribute titled, “File Formats”, since I want to offer both MP3 and WAV formats under this product listing. When you create the attribute, there will be a box titled, “Values”. This is where you would add your variations. So for mine, I added “WAV | MP3” to the box. The “|” sign is used to separate the different values/options. Also, there will be a checkbox that says “Used for Variations” be sure to check this. Here you’ll see all of the variations you have created for this product. 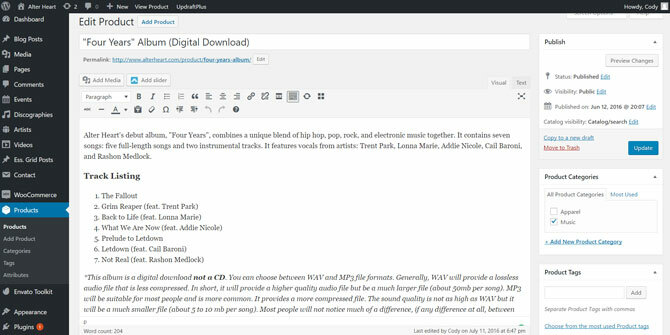 In my example, you can see I have a variation for “WAV” and “Mp3”. You won’t have any created yet, so you’ll need to create them (only if you want to offer a product with variations, otherwise move onto the next tab). 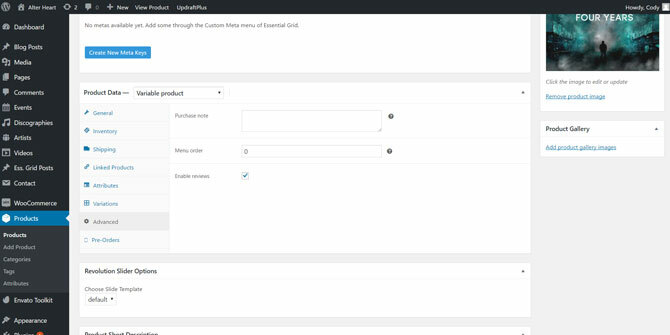 To create your variations, click the drop down box that says “Add variation”. There will be quite a few options. 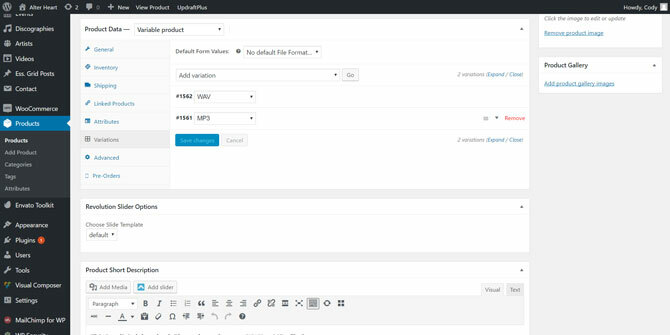 You can add variations manually but if you added an Attribute with values (in the previous tab), you can click “Create variations from all attributes” and all variations will be created automatically. In the above example, I clicked on the “WAV” variation. You’ll see that you can set the different options for this variation. You can give it a different SKU, different price, keep track of stock, etc. You can also decide if the product is enabled (meaning it will show up live on your product page), and whether it’s a virtual and downloadable product. Since this product is a download, I’ve selected the “Downloadable” and “Virtual” (this is used if a product is not physically shipped) checkboxes. One option would be to add your downloadable file (in this case, a WAV file) to Dropbox or Google Drive and get a shareable link. Then, you could add the link to the “File URL”. Another option (and the one I’ve chosen to use) is to upload the file to your website. Click “Choose File” and you can upload the file. It will then be downloaded from your site when someone makes a purchase. Here you can enable reviews for this product and include any purchase notes. Now the last tab, “Pre-Orders”, will only show up here if you purchased and installed the Pre-Orders plugin from WooThemes like I mentioned earlier. Here you’ll be able to enable pre-orders for this product, set a release date, set the pre-order fee, and when the customer will be charged. This description will show up just under the price on your product page (as you can see in the image above). Here you can offer a quick overview of the product. That’s it! The product is live and it will be listed on your shop page for visitors to find. I know this post was quite long and setting up a product can be a bit difficult at first. So if you have any questions, leave them in the comments below and I’ll do my best to answer them.